Hand Me a Handbar is an introduction to safely using buoyant equipment in the water to enhance and add variety to aquatic fitness workouts. Each video shows a basic move, as well as progressions and options for changing the stance or active movement of the legs or arms to add challenge or variety. Several ideas are presented in this course for handbar use. Add spark to your handbar workouts. Describe 5 kinds of aquatic equipment. Discuss 7 aquatic principles that affect exercise in the water. Describe aquatic muscle actions without equipment and with the addition of buoyant resistance equipment including buoyancy resisted and assisted. Discuss buoyant equipment care and storage, safety, and program formats. 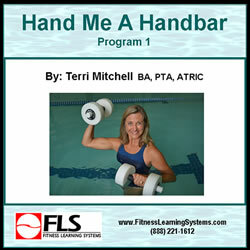 Explain how to safely and effectively perform 25 exercises using handbars in the water.